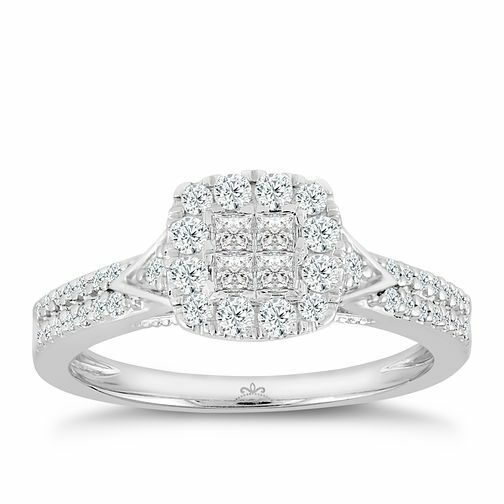 A gorgeous and glistening diamond ring, set to have your lady feeling like a princess. Princess cut diamonds take centre-stage of the sparkling centre-piece, surrounded by a stunning halo of set stones. The shine doesn't end there, with shoulders set with more dainty diamonds for extra opulence. The total diamond weight of this ring is 0.50ct. Princessa 9ct White Gold 1/2ct Diamond Ring is rated 5.0 out of 5 by 4. Rated 5 out of 5 by Anonymous from Simply stunning! A lot bigger than expected and the sparkle in natural light unreal, absolutely stunning and full of detail.